Image © DC Entertainment. Written by Dan Jurgens, art by Mike Perkins, colors by Hi-Fi, letters by Dave Sharpe. 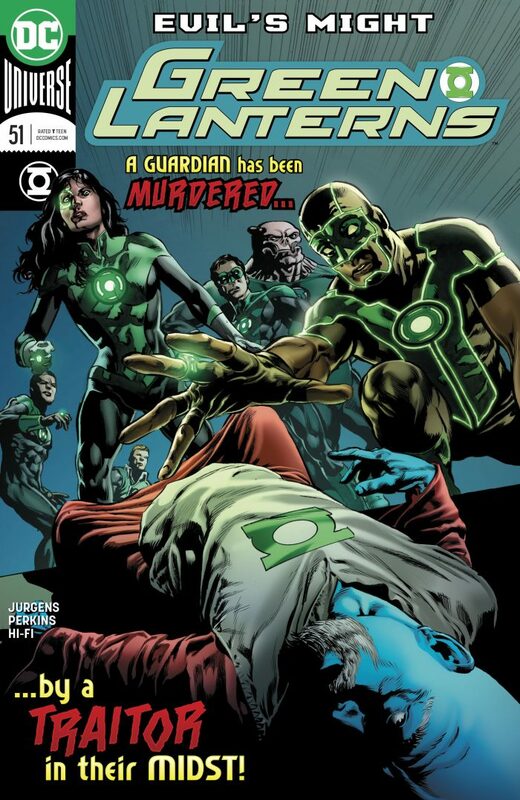 Death in the Green Lantern Corps is not unusual, they are a police force after all, but the death and perhaps murder of one of their superiors, the Guardians of the Universe, is another matter. It’s far from the only thing going wrong in the GL realm. Their headquarters, the sentient planet Mogo, is unresponsive and for the first time is experiencing strong storms that threaten the structures and inhabitants. Elsewhere, a new threat perhaps called The Effort is destroying worlds and GL rings seem not only to be ineffective against it, but even turning against their wearers. Jessica Cruz’s ring is contacting her in secret about this, as if the other Corps members around her can’t be trusted. Things are going from bad to worse in this well-written storyline by Dan Jurgens, who knows how to effectively build tension and suspense. I liked the art by Mike Perkins better this time, it seems to have settled a bit, and the character identities were clear throughout. The most fun I’ve had reading this title so far, perhaps. This entry was posted in Comics, Reviews on September 11, 2018 by Todd.